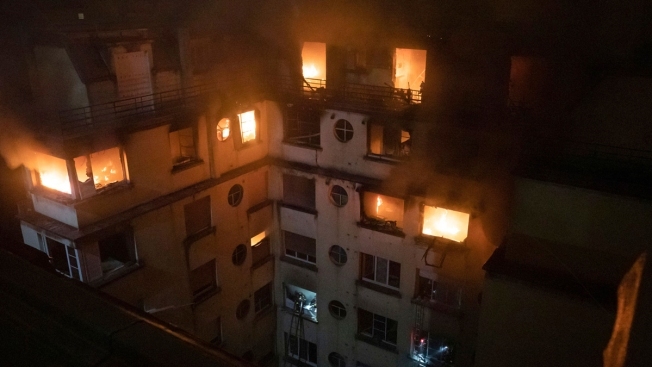 Paris' deadliest fire in over a decade claimed 10 lives, sending fleeing residents to the roof to escape the flames that engulfed their apartment building before dawn Tuesday. A 40-year-old female resident, said to have a history of psychiatric problems, was detained near the eight-story building in the quiet neighborhood as police opened an investigation into voluntary arson resulting in death. It is the deadliest fire in Paris since the April 2005 hotel fire near the capital's famed Opera that killed 24 people. French President Emmanuel Macron took to Twitter to express that "France wakes up with emotion after the fire in rue Erlanger in Paris last night." Interior Minister Christophe Castaner was the highest-ranking official on the scene, as plumes of smoke speckled the sky. Firefighters rescued some from the roof as well as others who had clambered out of windows to escape the flames. Castaner said the blaze that started on the second floor had been extinguished, and that over 30 people were being treated for "relatively" light injuries. "I heard a woman screaming in the street, crying and screaming for help," said witness Jacqueline Ravier, who lives across the street. She saw a young man blackened by smoke and a woman motionless on the ground. She said flames were shooting out for hours from the top of the building and smoke-covered victims were fleeing. "We feel the smoke," she said. "What's surprising is how long it lasted." "The situation was already dramatic when the firefighters arrived," Cognon said. Castaner said the woman detained had "a history of psychiatric problems." The building is on Rue Erlanger in the 16th arrondissement, one of the most high-end and calmest districts of Paris. It is close to the popular Bois de Boulogne park and about 1 kilometer (less than a mile) from the Roland Garros stadium that hosts the French Open tennis tournament and near the Parc de Princes stadium that's home to Paris Saint-Germain, the country's top soccer team. In September 2015, there was a fire in a northern neighborhood that left eight dead. Nicolas Garriga in Paris contributed.